The National Library recently purchased a group of literary papers relating to Edward Thomas (1878-1917), the poet, writer and soldier, all of which were all once in the possession of his friend the Gloucester lawyer Jack Haines (1875-1960). They include two letters from Thomas to Haines and one from Thomas’s widow, Helen – the latter containing a frank description of the relationship between her, Edward and his close friend and fellow poet Robert Frost – as well as an apparently unpublished book review in his hand, dating from 1903, and several typescript copies of his poems. However by some distance the most significant and interesting item is a school exercise book once used by Myfanwy, Edward Thomas’s daughter, which was reused by him to write his poetry. The majority of the pages were torn out of the book long ago, probably by Thomas himself, but the remaining eight leaves contain multiple drafts of two of his very earliest poems ‘The Mountain Chapel’ and ‘Birds’ Nests’, dated 17 and 18 December 1914. Until now no autograph copies or drafts of these were known to exist and so the manuscript potentially adds significantly to our understanding of his development as a poet. The manuscript also has a draft of another poem ‘House and Man’, which was one of two published in the journal Root and Branch in 1915, the first of Thomas’s poems to see print. 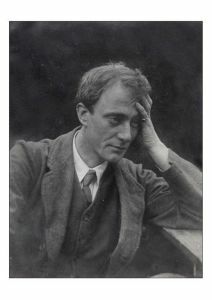 The manuscripts are a valuable addition to the National Library’s already significant collection of manuscripts and papers of Edward Thomas, which include manuscript drafts of many of his poems, correspondence with his wife, his diaries, among them his 1917 War diary, and his letters to W. H. Hudson. Some twenty months ago an archive was transferred to the Library and for the past few weeks, I have been given the privileged task of arranging and then listing the papers. They are of the late T. Ifor Rees, the first British Ambassador to Bolivia. It was expected that the collection would be interesting, not only for the fact that it would fill a number of gaps in the collection of his father, the musician J. T. Rees that was already here. However, whilst arranging his literary works, after removing some papers that were placed in a rusty springback binder that had held everything together for decades, there was a brown envelope placed at the bottom of the bundle. 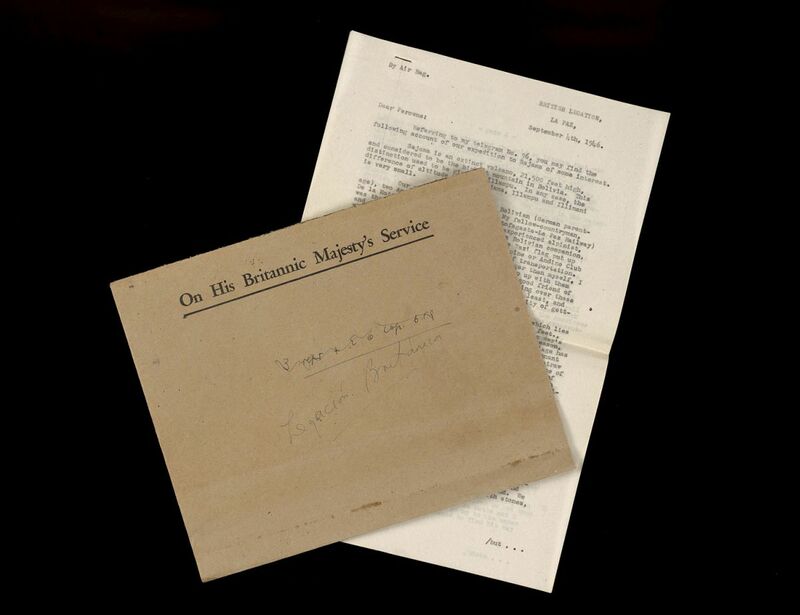 Although “On His Britannic Majesty’s Service” was clearly marked on the envelope, it was assumed that it contained a further draft or notes belonging to one of the publications of T. Ifor Rees on Mexico, as that was the work in hand. But this envelope was in need of further attention. It was sealed, and that due to it being in a damp place sometime in the past and the glue reactive to re-seal the envelope. Or possibly, the envelope may not have been opened since it was originally sealed. The envelope had to be opened to ensure that its contents were to be placed in the relevant group. It contained three carbon copies of a typescript letter written from the British Legation in La Paz following an expedition to Sajama. T. Ifor Rees was a British Minister at the time, and as one who enjoyed mountaineering and taking photographs in his leisure time, had the opportunity to walk the highest peak in Bolivia (21,500 feet) with four other companions. According to the report, it seems that this had been somewhat of an adventure to the mid-fifties diplomat from north Cardiganshire, which had a tragic end. With the urge of finding out more about the event and being aware that he had published a book under the same name as this extinct volcano in 1960, it was somewhat surprising to read that he did not present the story as he did in that original report he wrote within a month of the historic adventure in August 1946. However, this reminds us that reporting events of the past varies with the passage of time, and that one has to depend on the original sources that were created at the time to ascertain the full story – and ultimately, that’s why archives are so important. It is intended to complete the work on this archive shortly and an online discovery resource will be published in the Spring. 100 years on the National Library of Wales, Aberystwyth is securing the legacy of Edward Thomas by collecting and digitising his archive, with 5 new opportunities for the public to engage with his archive. This week we will be noting the death of the poet Edward Thomas (1878 – 1917) who was killed in action soon after he arrived in France at Arras on Easter Monday, 9 April 1917. It was not until 1914 that he wrote his first poem, and due to his tragic death he did not live to see the publication of his Poems (1917) (under his pseudonym Edward Eastaway), nor the subsequent Last Poems (1918) and Collected Poems (1920). On Wednesday (5 April 2017) Dr Andrew Webb, (Head of School of English Literature, Bangor University) will explore Edward Thomas as a Welsh writer, considering his Welsh heritage, his connection to figures including O. M. Edwards, and the ways in which Wales informs his prose and poetry. Tickets for the lunchtime lecture are available here. 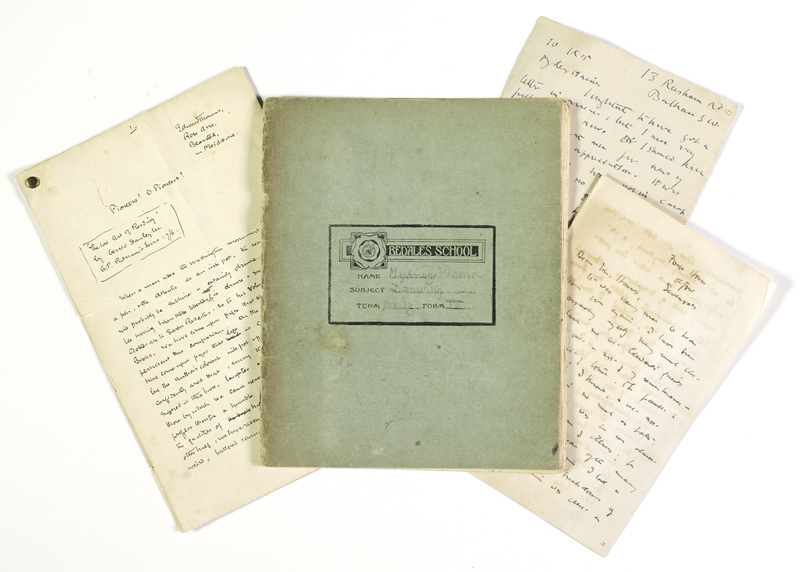 The diaries and manuscripts of the poet and prose writer Edward Thomas are held at the Library, and include diaries, letters, draft poems and the original manuscript of Edward Thomas, The Heart of England (London, 1906) and the catalogue is available to view online. Also a newly acquired archive of Geoffrey Woolley contains letters from Edward Thomas, and a file on Edward Thomas publications, with loose pages from ‘The bookman’, comprising copies of Edward Thomas’s poetry columns and book reviews. This is a brand new source of research for life and work of Edward Thomas. The presentation given by Dr Andrew Webb coincides with our exhibition to note the centenary of his death in action during the Battle of Arras. One hundred years ago two poets were killed in battle during the Great War: Hedd Wyn and Edward Thomas. The exhibition Fallen Poets: Edward Thomas & Hedd Wyn runs to 2 September 2017. 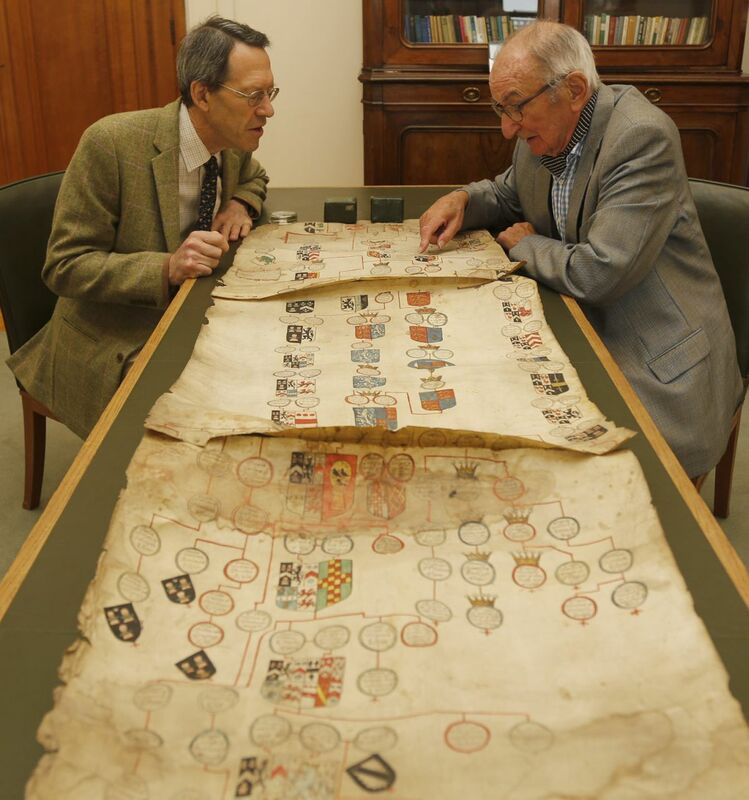 Many of his manuscripts have already been digitised by the National Library and more are being digitised during the centenary year. A new webpage relating to Edward Thomas and his collection has been published and available to view on the Library’s website. Last month, we received an important and substantial film accession. This arrived by lorry from S4C in Cardiff. It roughly consists of around 400 cans of 35mm & 16mm prints of film and animation which date predominantly from the 1980s and 1990s. The first task after un-loading the shrink wrapped collection of 10 pallets was to make an inventory and then this information will be input into our library’s database. Although many people perhaps think of the work of a film archive as a rescue mission for old and neglected (and mainly black and white) footage, the truth is that collecting ‘current’ work is just as vital to the, preservation of our film heritage. The films of Cardiff-based filmmaker Steve Sullivan have been on the Archive’s wish-list for some time, and now we have them! … Steve turns out to be the ideal depositor, having carefully labelled and indexed his reels in preparation, making our work a great deal easier at the other end! His BAFTA-winning film, ‘A Heap of Trouble’, has already been housed in the Archive for some years, and now we are delighted to add ‘Fatted Calf’ (joint winner of the 1998 DM Davies Award), ‘The Debt’ (1998) and ‘Dreams and Desires’ (1997) – tales of the unexpected all! We look forward also to seeing Steve’s first feature film, ‘Happy Hours’, … and eventually to preserving it, too, for posterity! On October 29th last year, at the Gate venue Cardiff, I interviewed a great lady, great songwriter and an awesome voice. The lady’s name is Mary Hopkin, yes the lady who brought us such joy as “Those were the days”, “Knock knock who’s there”, “Aderyn Llwyd”, “Earth song” and a wonderful version of “Streets of London”. I have been a fan of hers since I heard her distinctive voice in my teens, in the early 1980’s. This interview has been the product of careful diplomacy with Mary’s daughter, Jessica Lee Morgan, and I thank her on behalf of the Archive for her help in this. Mary is very cautious of the media and interview requests in general and so to have the chance to meet and talk to Mary was simply brilliant. I was determined to interview Mary for the Archive to have an unedited (in her own words) recorded item of her whole career. I have to admit, whilst waiting for the right time, I was nervous and unsure, but I shouldn’t have feared. When Jessica introduced me to Mary all the pre-notions went away. Mary was very welcoming, hospitable and talkative. The interview lasted just under half an hour, spanning her first singing experience at home right up to the evening’s main focus – showcasing her daughter’s album release and concert. The interview was free flowing, I stayed away from asking too many questions about Opportunity Knocks, the Apple Records years and The Beatles. Seeing Mary visibly and enthusiastically supporting her children; her son Morgan as well as daughter Jessica was very humbling. Recent re-releases of her studio albums have dominated media coverage of Mary but on this particular night it was all about Jessica’s album “I am not” and Mary and Morgan’s collaboration album “You look familiar” concentrated the mind on the here and now. A public performance by Mary Hopkin might not be on the cards but I’m very heartened to see that the song writing, lyrics and the talented voice have not abandoned her. The National Screen and Sound Archive is proud to collect Mary’s, Morgan’s and Jessica’s musical discography and I would like to thank Jessica, Morgan and the band for a wonderful concert and thank Mary herself for agreeing to be interviewed. This interview is now available at the Archive. One of the biggest youth festivals in the world is visiting our neck of the woods this week. The Urdd National Eisteddfod is being held, in glorious sunshine, in the grounds of Llanerchaeron mansion, near Aberaeron. “Urdd Gobaith Cymru”, or the “Urdd” as it’s known, founded by Sir Ifan ab Owen Edwards, who made the first Welsh language talkie “Y Chwarelwr”, is a strong and vibrant youth movement. It runs residential activity centres in north and mid Wales, and has a base at the Millennium Centre in Cardiff. The Library has a “stand” at the festival, and NSSAW is screening one of the stage highlights. Recently we received a very interesting batch of films, some of which are early generation copies of movies made by Sir Ifan, including Urdd cruises from the thirties. The films show Urdd members and their families enjoying trips as far afield as Norway, Brittany, Spain, Portugal and north Africa.